These hosta shoots have been blanched, then tossed with olive oil, salt, and pepper. They’re ready for roasting! These hostas are at the perfect stage for harvesting; each shoot is still tightly wrapped and at its tender best. Be sure to harvest before they unfurl. When you think about hostas (and daylilies and roses and dahlias), you probably focus on their appealing foliage and vibrant blooms. Surprisingly, these plants are delicious as well as lovely. In fact, many of our favorite garden plants can feed both body and soul. Here’s a quick peek at how to harvest and prepare hostas for maximum deliciousness and beauty throughout the growing season. 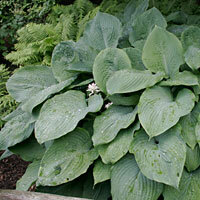 Hostas are one of the world’s most popular shade plants. In the U.S., we grow them for their beauty alone, but in Japan Hosta montana is grown as a commercial crop. Plants are cultivated in greenhouses and kept covered to blanch/tenderize the foliage. Steamed or lightly boiled, then served with a miso-mustard sauce, they make a traditional spring dish. This gorgeous hosta is too mature and fibrous to be delicious. I’m not suggesting you raze your shade garden or ransack the hosta collection at your local botanical garden. But when young shoots poke up through the ground in spring, why not experiment with a new vegetable? The taste varies among species and cultivars, but all are safe to eat. 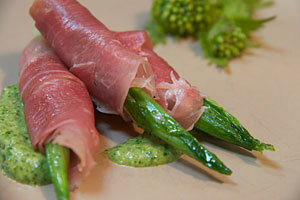 For a heartier dish, wrap roasted hosta shoots in prosciutto and serve with a little pesto. The newest, tightest shoots are the most tender. 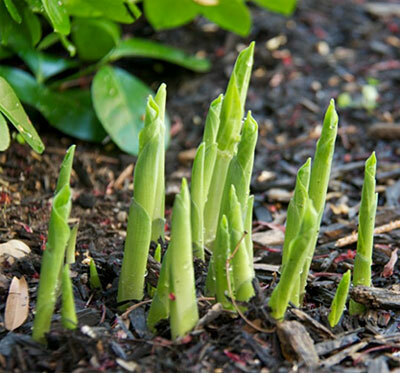 Harvest them before the leaves start to unfurl. Shoots can be prepared in several ways. The taste is light, mild, and fresh, somewhere between lettuce and young spinach. In a pot of boiling water, blanch them whole, till tender. Toss with olive oil, salt and pepper; roast in the oven at 450 degrees F for 5 to 10 minutes, depending on the thickness. To add more flavor, sprinkle the roasted shoots with Parmesan cheese and broil just long enough to melt the cheese. Chop the raw shoots and stir fry them. Serve over pasta or rice, with garlic and soy. To preserve the integrity of your plant, harvest from the outer ring of shoots, working your way evenly around the circumference of the hosta. Don’t remove more than one-third of the shoots. If you’ve been meaning to divide your plants, why not set some shoots aside to serve for dinner? You’ll never look at a hosta the same way again. Ellen Zachos is the proprietor of Acme Plant Stuff, a garden design, installation, and maintenance company in New York City. She is a Harvard graduate, a garden writer and photographer, and an instructor at the New York Botanical Garden. 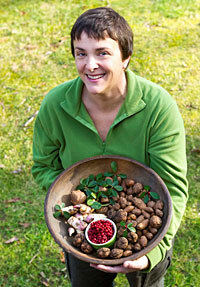 Ellen is the author of six books, including Backyard Foraging: 65 Familiar Plants You Didn’t Know You Could Eat. If you live in Vermont, I hope you’ll join me for two seminars on March 29 at the Burlington Gardener’s Supply garden center. When you think about hostas and daylilies, you probably focus on their appealing foliage and vibrant blooms. Surprisingly, these perennials are delicious as well. Many of our favorite garden plants can feed both body and soul. Learn how to recognize, harvest and prepare tasty treats, such as wintergreen sorbet, rose hip soup and dahlia tuber bread from plants you already have around your home. Annuals are popular as stand-alone plantings and mixed with perennials to fill in gaps and add splashes of color throughout the season. Learn how to grow and maintain old favorites and new varieties of annuals. Look at basic propagation techniques, such as starting from seed and transplanting seedlings successfully. The spring seminar series is under way at our Vermont garden centers. Click to see the full schedule. Your Houseplant is an Annual in Disguise! & fellow cooks will be glad to know this.